For the past year I have tried in vain to find a way to make kidneys palatable. I have soaked them in milk, in gingerale, I have cooked them quickly at high heat and slowly at low heat, I have bathed them in butter, injected them with sherry, coated them in crushed garlic, and all I was left with was a kitchen that smelled like a urinal on a hot summer’s day. I did all of this in the name of Leopold Bloom. That night I re-opened Ulysses and started searching for something else to cook. Tomorrow, June 16th, is Bloomsday–a day in which James Joyce enthusiasts in Dublin celebrate his life by reliving the events of June 16th, 1904–the day that the entirety of the novel Ulysses takes place. Joyce chose June 16th as the date of Leopold Bloom’s wanderings because it was the day of his first date with his wife and muse, Nora Barnacle (was there ever a better name?). The first Bloomsday took place in 1954, on the 50th anniversary of the book. It has since become an institution in Dublin, with thousands of people gathering every year to follow Leopold Bloom’s pilgrimage throughout Dublin, drinking at the pubs where Bloom stopped, wearing costumes from the novel, some even holding marathon readings of the entire novel–a process which I’m told can take up to 36 hours. Unlike a lot of my friends who found the process of reading Ulysses exhausting and brain-numbing I have very fond memories of my first reading of it. I was a junior in college, taking a class on 20th Century Irish writers in a tiny, mahogany and window-filled classroom in NYU’s Ireland House. Spring had finally hit New York after a long and dreadful winter filled with gray slush and heartbreak. It was in this class that I met, as Anne of Green Gables would say, my “bosom friend” and it was over Ulysses that we first bonded. After class we drank mugs of beer as large as our torsos and–when we weren’t discussing how dreamy our professor was–tried to make sense of Joyce’s writing. When people think about food in Ulysses the first thing that comes to mind is always Leopold Bloom’s craving for “a mutton kidney at Buckley’s. Fried with butter, a shake of pepper. Better yet a pork kidney at Duglacz’s.” His hankering for a kidney with butter and pepper presents itself over and over again throughout the novel, but there is also (much to my relief) a plethora of other food in the novel. In the chapter “The Lestrygonians,” a hungry Bloom wanders in search of lunch, considering roast beef, cabbage, oysters, seedcakes, hundred-year-old eggs, caviar, sardines, crisp onions, truffles and cheese sandwiches. In Greek mythology the Lestrygonians (or Laestrygonians) are a tribe of cannibalistic giants. In Homer’s Odyssey they eat many of Odysseus’ men and destroy twelve of his ships. This grotesque image hangs in the background of this chapter of Ulysses, as Bloom ponders how disgusting people often look in the act of devouring food. It is my favorite chapter in the novel, and one that I used to think of often when, exhausted and covered in oven burns, I would watch the hungover masses at brunch shoveling my lovingly-prepared biscuits too quickly into their mouths. Leopold Bloom isn’t the only character in Ulysses who worries about how grotesque the act of eating can be, Gerty Macdowell also mentions her fear of how unappealing she might appear while eating in the chapter “Nausicaa.” Gerty fantasizes about what a fantastic housewife she will someday make, imagining the praise she will get for her phenomenal cooking–specifically for her flawless rendition of queen Ann’s pudding. 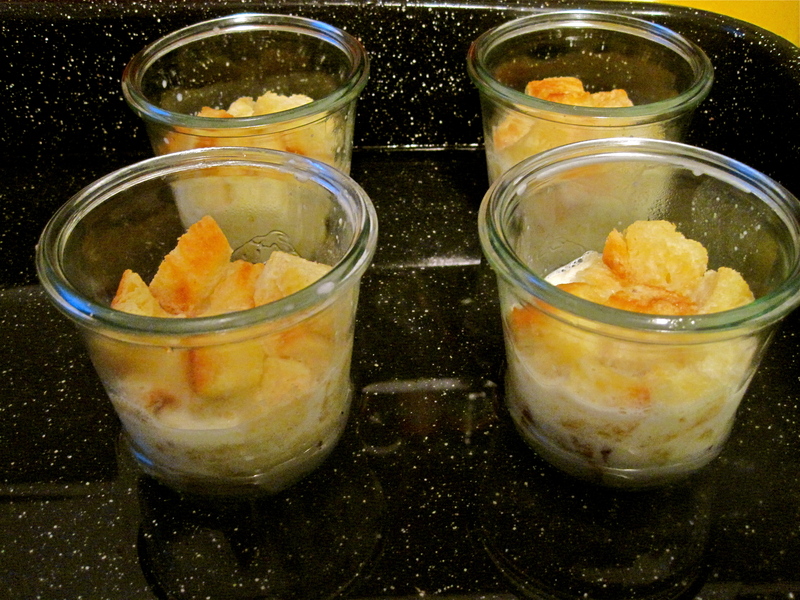 Being from states, I had never heard of queen Ann’s pudding before reading Ulysses. 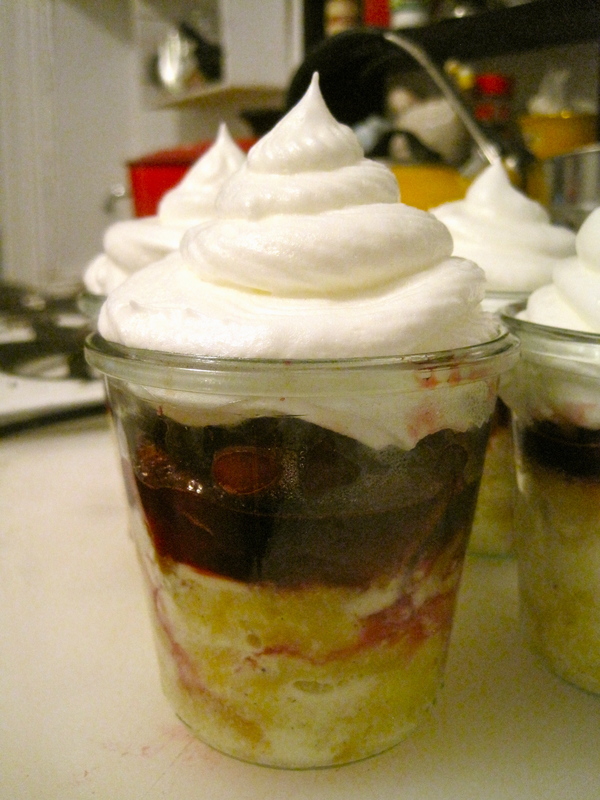 I couldn’t find a recipe for it anywhere but there were lots of recipes for something called “queen of puddings,” which from Joyce’s description sounds like it is essentially the same thing. 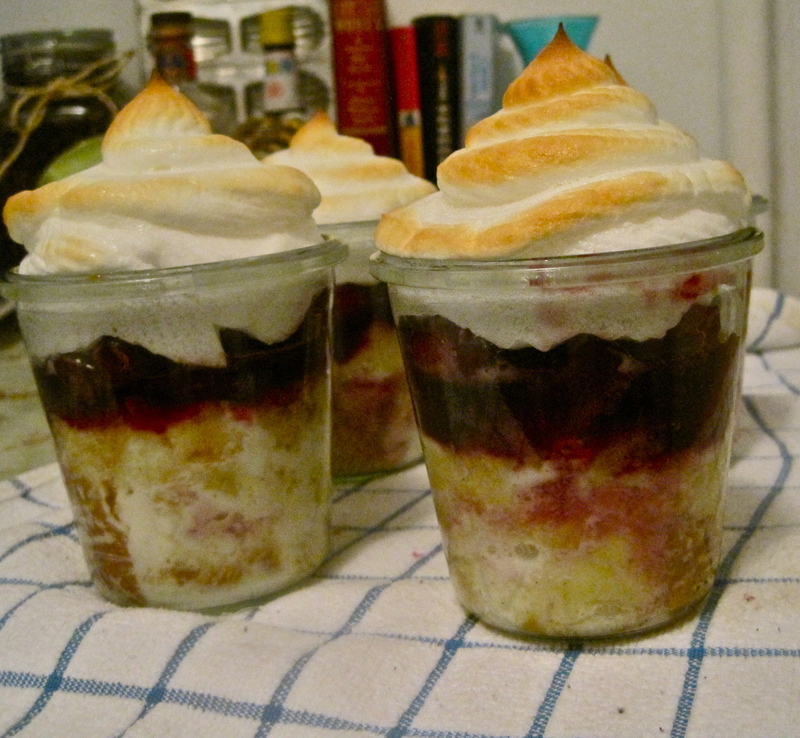 Queen of puddings is a classic British dessert consisting of a bread pudding topped with either jam or fruit compote and covered in a chewy, toasted meringue. 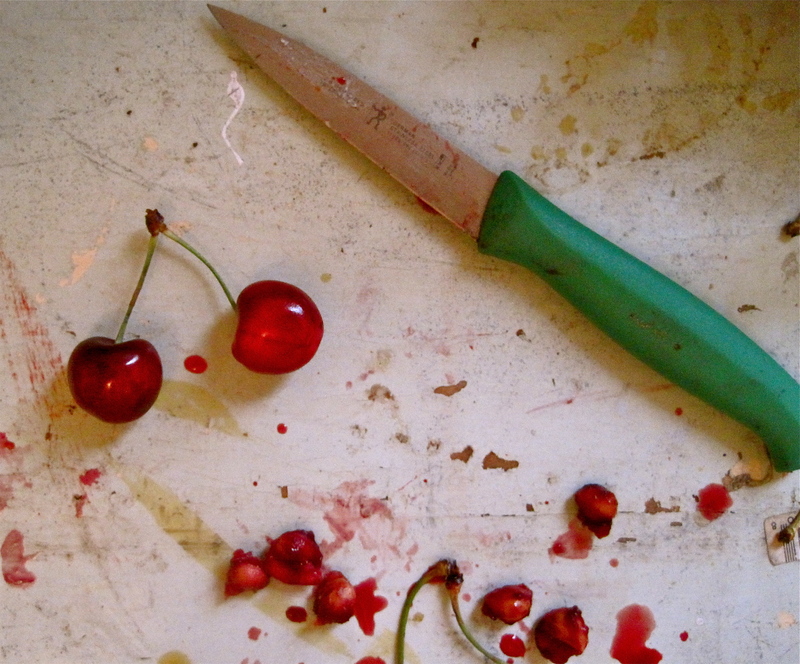 It is absolutely delicious–much better than a kidney prepared any which way. 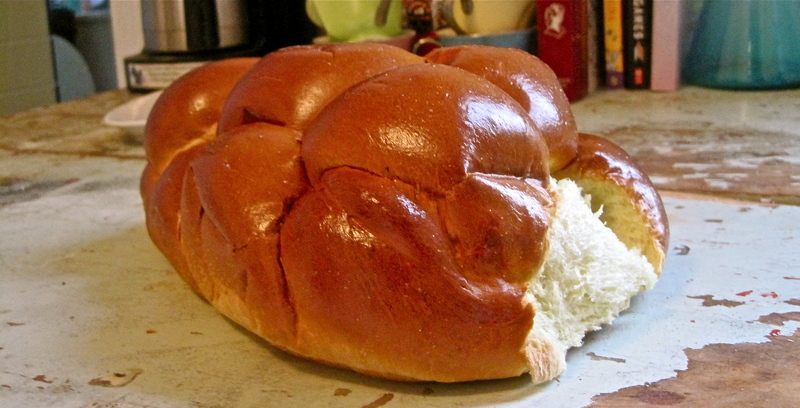 Cube the loaf of challah into small cubes. 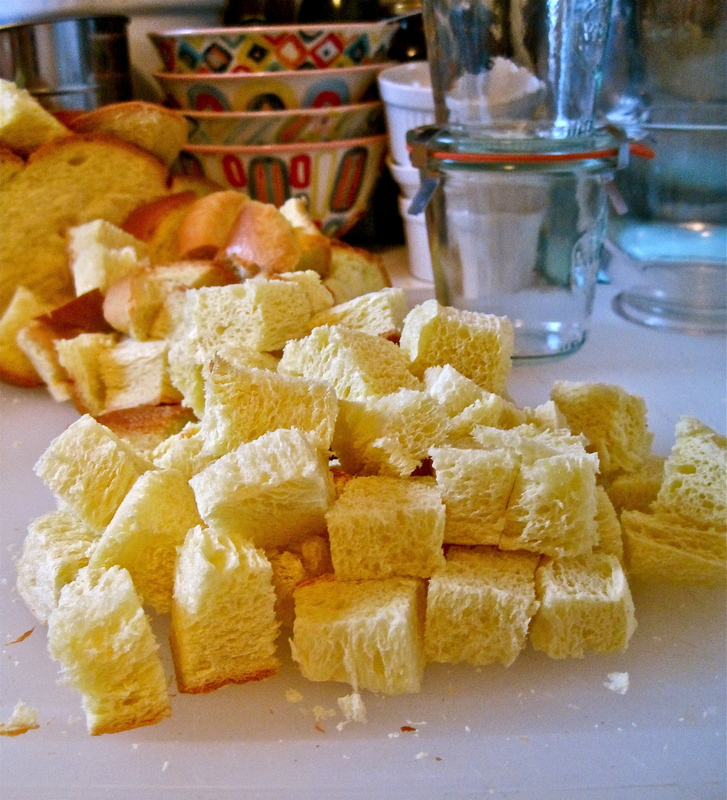 Melt butter in a saucepan and toss bread cubes to coat. Lay them out in an even layer on a sheetpan and bake at 350 for about 15 minutes, or until lightly browned. 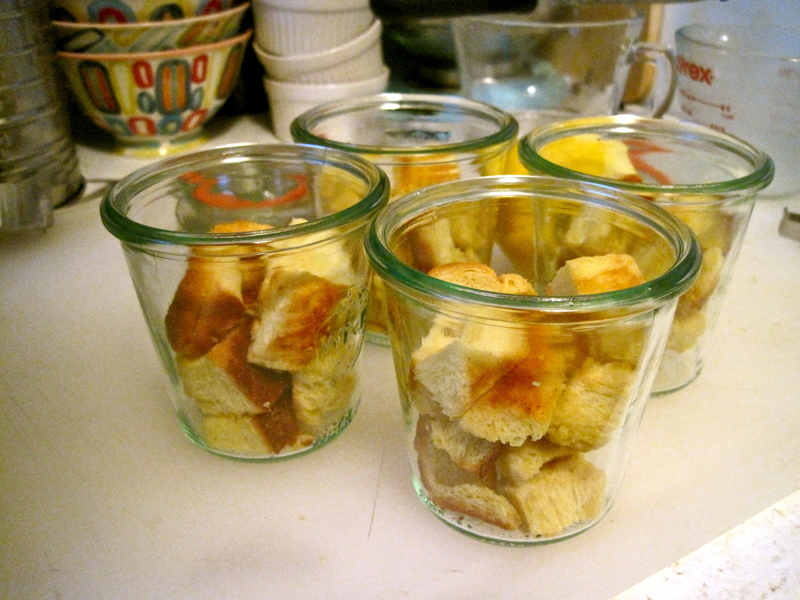 Once they are toasted and cooled place them at the bottom of 6 ramekins until they are about 2/3 full. Put milk, cream and the seeds and pods of vanilla beans in a medium saucepan. In a separate bowl whisk eggs and sugar together until light and fluffy. Heat milk and cream until almost at a boil then slowly whisk in the egg yolks/sugar mixture, whisking vigorously the whole time so the eggs don’t scramble. Remove from heat and allow to cool. Once cooled, pour over even breadcrumbs in six even batches and let them sit for about 10 minutes, or until the bread has absorbed much of the liquid (it doesn’t have to absorb it all). Place ramekins in a hot water bath that reaches about 1/2 way up the sides and bake at 350 for about 20 minutes, or until almost completely set but still slightly wiggly. 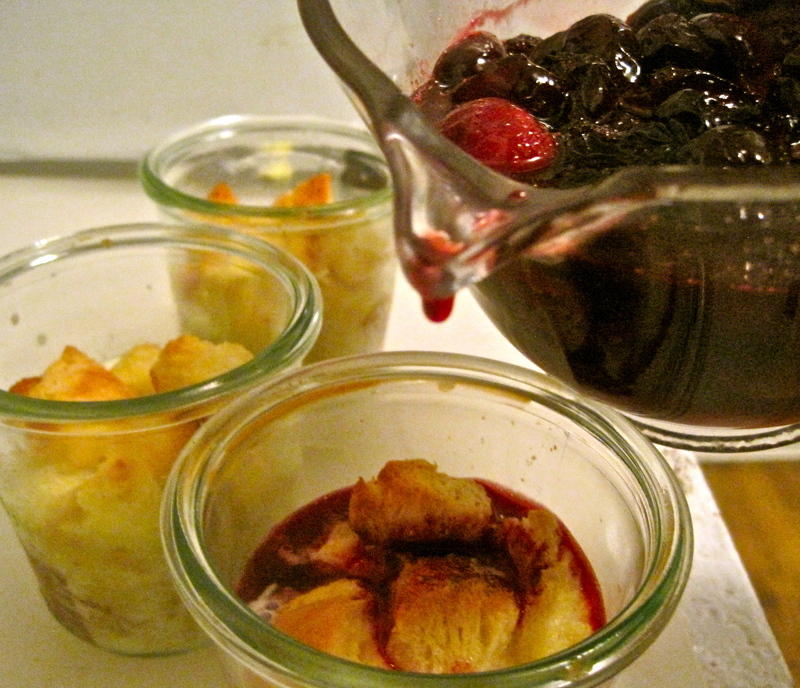 While the pudding is setting make your cherry compote. 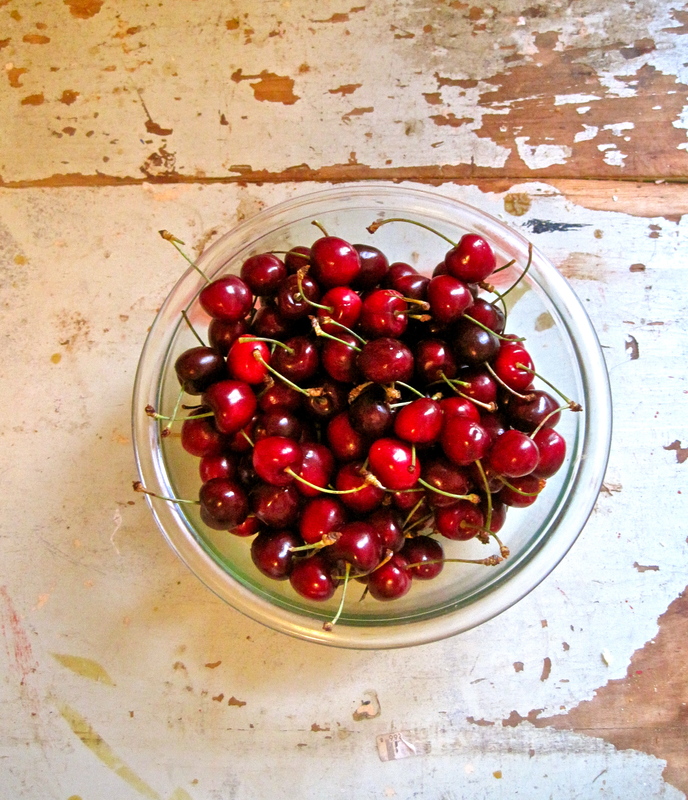 Place pitted cherries, sugar and zest into a medium saucepan and let them simmer over medium-low heat until most of the juices are released and slightly thickened. 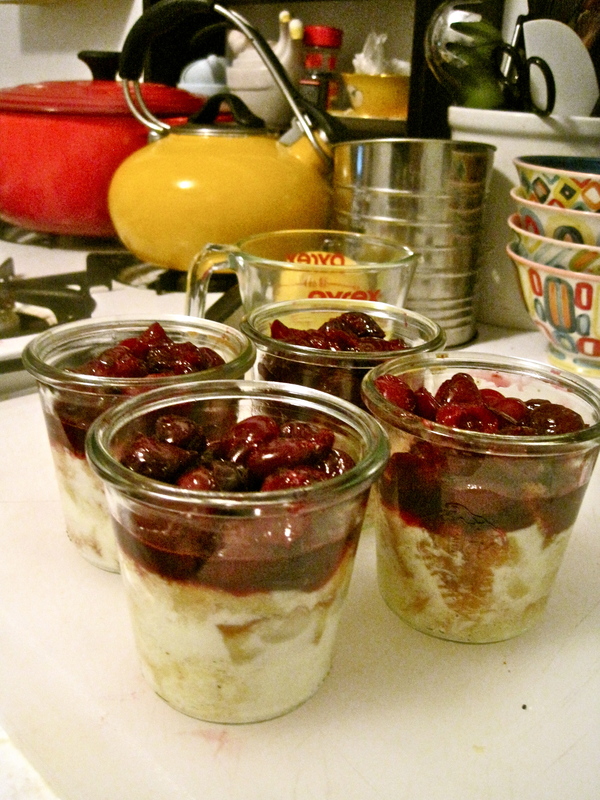 Once pudding is set and cooled pour cooled cherry compote into the ramekins evenly (you may have a little bit left over, but that’s not necessarily a bad thing). Now prepare your meringue. 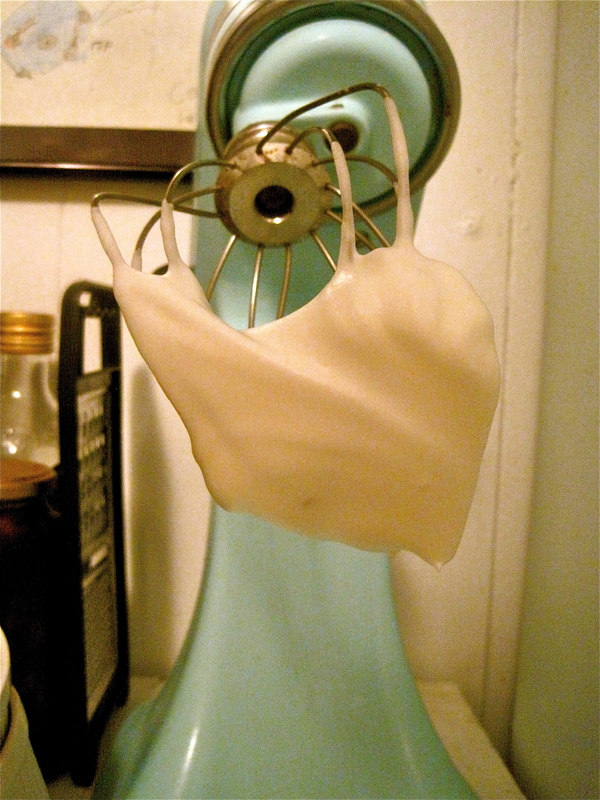 Place egg whites and cream of tartar in the bowl of your mixer, fitted with the whisk attachment. Whisk on high speed until whites start to foam. Slowly add sugar and continue to whisk until the whites are glossy and hold stiff peaks. Once this happens, remove from mixing bowl and transfer to a piping bag. 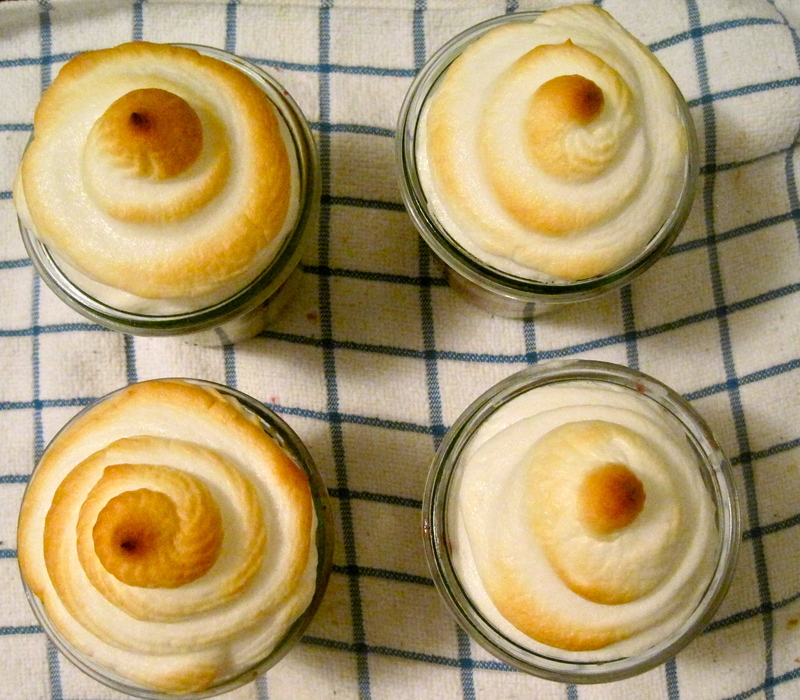 Pipe meringue onto each of the cooled puddings and place them in the oven at 350 for about 7 minutes, or until meringue is golden brown. On a separate note, if you’re reading I would really love it if you subscribed to Yummy Books! All you have to do is click the “follow” button. It helps me in a number of ways–one of which is being able to more accurately track where my hits are coming from. It is anonymous if you want it to be and it only means that you will get one email every week or two with an update–as long as you sign up to be a blog subscriber and not a comment subscriber. Thank you so much to all of my current followers, I appreciate you all more than you know!